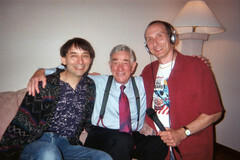 Kenny Savoy, Shelley Berman, Joe Bev. Over the next few months, I will be making available many of my best radio theater, which I produced over the last 35-years. Feel free to e-mail me with your comments and questions. "His Second to Last Bow"
"Tales From the Vienna Wards"
"The Giant Rat of Sumatra"
"Fourth of July Fireworks at Camp Waterlogg"
JULY 4th special returns by popular demand!